To help make your puppy more comfortable with being brushed, make it a rewarding experience by pairing it with treats and praise. Our friendly, happy puppy hates having his fur brushed — he will run and hide when he sees the brush come out. What can we do to get him used to being groomed? Dogs tend to remember experiences that are painful, scary or otherwise upsetting, especially if the negative experience occurred in the formative puppyhood weeks. Running away when the brush emerges most likely indicates that your puppy is feeling fear, anxiety or stress connected to the experience of being brushed. Fortunately, it is possible to transform your dog’s response to the brush. The strategy is to pair brushing with positive and enjoyable experiences. Your first step, though, is to ensure that your puppy’s dislike of brushing isn’t related to a physical condition. An infected ear or inflammation in the joints, for instance, may cause a dog to balk when handled on or near these sensitive areas. Start with a trip to the veterinarian to rule out any medical reasons for your dog’s behavior. Once he has a clean bill of health, it’s time to teach him to love being groomed. 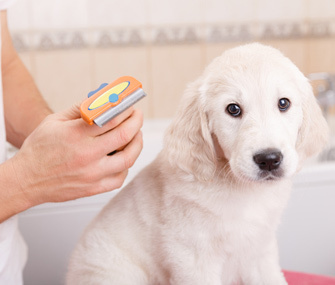 Your dog may bolt from the brush because grooming is uncomfortable or even downright painful. Start by assessing the brush you are using; make sure that it’s not pulling your dog’s coat or hurting his skin. Hard metal bristles may pull your dog’s fur, while bristles that have lost their protective ends may be poking into his skin. Switching the type of grooming tools and products you are using may improve or even resolve this problem. A soft, flexible detangling brush and a dog-specific detangling product (used as needed) can go a long way toward reducing your puppy’s discomfort and easing his trepidation. It's also possible that the issue is not with your brush but rather with the way you are brushing. Instead of yanking or ripping through a knot or mat, gently work out tangles. If you encounter a stubborn knot, gently hold the fur just below the knotted area with one hand to help prevent pulling at the skin. Starting at the edge of the mat or knot, slowly work toward the center of the tangle. You should be able to gently tease the mat or knot apart without pulling your dog’s fur. In tough cases, a groomer may need to assist in working through or cutting out established mats. Regular brushing and grooming maintenance can help to keep your puppy’s coat tangle-free.